Bow Software are a Digital Interactive Agency who are looking for a .NET developer to join our small but growing team in Okehampton, Devon. (ahem: this may be sounding familiar from a recent post. That's because it is, however this time round we're opening up the position wide and would really like to hear from developers just starting out perhaps looking for their first commercial post as well as developers with a proven commercial track record). This position is for a .NET & C# framework developer with jQuery, WPF, MVVM, MVC and SQL experience. As a small development team, we are agile and are fortunate to be able to use forward facing technologies, not being bound by historic legacy products. Our project life cycle is typically 3- 9 months and includes Interactive software applications for the retail, heritage and engineering sector for small to large clients based throughout the UK. We are also starting to develop mobile applications so would be interested to hear from candidates with Metro and Android knowledge. This position is suitable for graduate to mid weight developers, and is a great opportunity for someone with the right skill set and ambition to work alongside our Technical Director, who will grow in confidence to work independently and be an instrumental member of the team. Being small we're short on bureaucracy, but big on agile. We have a clearly defined strategy for business growth that the right person will want to share. If you think this position is right for you please drop us a line. Bow Software a Digitally Interactive Agency. Type: Full time permanent position with a 3 month probation period. Salary: £18- 28K appropriate to experience. Please email your CV, introduction and contact info to charlotte@bowsoftware.co.uk with SOFTWARE DEVELOPER POSITION as the subject. We will acknowledge all applications received. Excited about the significant software projects we're working on and that are coming up we're looking for someone who has the skill set and ambition to work independently alongside our Technical Director with the confidence to grow into a position where they can offer technical guidance through code buddy sessions to younger developers in the team. 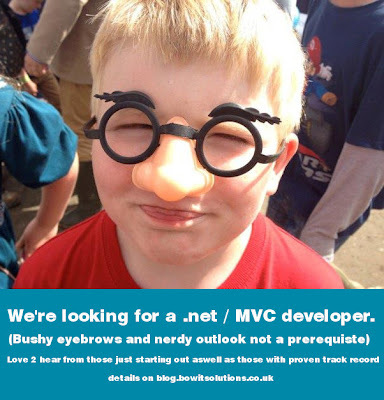 This position is for a .NET & C# framework developer with SQL and nUnit; jQuery, WPF, MVC and MVVM an added bonus. Confidence and familiarality with hardware and virtual installs useful. We are looking for an assured and competent individual who might be looking for an opportunity to move to the next level or to move onto something a bit more interactive and edgy. Our clients are small to PLC, mundane to juicy! Being small we're short on bureaucracy, but big on agile. We have a clearly defined strategy for business growth that the right person will want to share. If you think this position is right for you please drop us a line.